Wider Than You Ever Believed! Grace Will Succeed Publishing, 2017. 256 pages. It’s true – I’ve started collecting books on universalism. I originally came to believe God will eventually save everyone by reading the writings of George MacDonald and then searching the Scriptures to see if it could be true. But George MacDonald doesn’t give a direct, organized defense of universalism. Then I started finding more and more books that actually do defend universalism. My nagging doubts and questions all got cleared up. One of the most significant moments was when I learned that for the first 500 years of the church, while the leaders were native speakers of Greek, the most prominent teaching was that hell will not last forever, but is for the purpose of restoring and refining those who do not come to Christ while they are alive on earth. 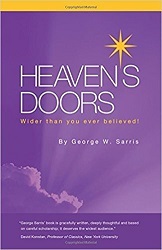 This book, Heaven’s Doors, didn’t contain anything I hadn’t heard before, but I think it may be my new first choice for explaining universalist views to others. The author takes the Bible seriously – He would not have come to this view if he didn’t believe it’s what the Bible teaches. He also researched the teachings of the early church fathers. But even though there is rigorous research behind his positions, he writes with a light and readable style. He even includes anecdotes at the start of each chapter. In fact, he was an evangelical pastor before he came around to these views, and had to leave the church where he was ministering because he no longer agreed with their Statement of Faith. This makes me very, very glad that the church I’m attending right now doesn’t require members to sign a Statement of Faith – they just ask you to affirm that you’ve accepted Jesus as the Lord of your life and desire to follow him. I did like his section on answers to common questions – some of the answers there were well said and helpfully articulate why certain passages don’t rule out universalism. He uses endnotes - more than 400 of them - and while that does help make the text readable, I would have preferred footnotes, because as it was reading the endnotes when I was all done with the book, I didn't always remember what it referred to. But that's a minor quibble. Throughout this book I’ve tried to look honestly and carefully at the major historical and Biblical issues that relate directly to the concepts of heaven and hell. I personally have concluded that all the people God created will ultimately be in heaven. He’s not partial – favoring some over others. He doesn’t change – acting graciously toward sinners while they’re alive on earth, but then withdrawing His hand of mercy at death. He’s not cruel – able to save all, but choosing rather to consign most of the human race to endless, conscious suffering. And He’s not weak – desiring to save all, but ultimately powerless to do so. God is good! God is powerful! And God is loving! Hell is real, but not forever. Jesus Christ succeeded in His mission to seek and save what was lost. For an articulate, well-organized and well-researched explanation of universalism and the Very Good News, this book is a good place to start.